We have recently managed the construction of a part two-storey and part single-storey rear extension to a family home in Buckinghamshire. Our clients had already received planning permission for the scheme, but needed assistance with producing construction drawings, finding suitable builders and then administering a building contract. On the first floor, a new master bedroom was added with an en suite bathroom. Downstairs the extension has allowed not only for a large open plan kitchen / breakfast room with folding doors into the garden, but also a useful utility and storage room. 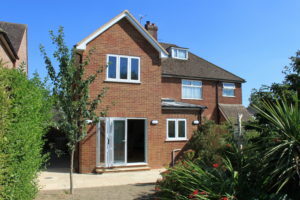 This entry was posted in Buckinghamshire, construction, contract administration, extension, House Extension, project management, refurbishment, renovation, Residential on July 27, 2018 by admin.